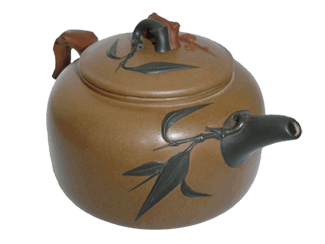 One can distinguish a good quality teapot from the maker's attention to detail in the design, and from the quality of the clay: its smoothness, feel and sound when rung. To determine the fit of the lid, and the feel and sound of the clay, it is best to view and handle the pot in person. However a picture can provide at least some idea of the level of quality of teaware we have available here at Apricot Grove, so that you know what to expect before you visit. This page is not a catalogue, but a gallery of some of the fine teapots we have (or have had) for sale. Our range of pots changes regularly, as we prefer to offer a variety of unique designs. So, while we cannot guarantee that the teapots shown above will be in stock when you visit, we can guarantee that the teapots in stock will exhibit similar quality and craftsmanship. Many of the teapots we carry are ‘certificate’ pots. This means that the craftsman (or woman) has included a certificate of creation, together with a picture of themselves holding the pot they have created. This is important when, for example, one purchases a pot for investment.